Those who seek a symbiotic connection with the spirit world in order to fulfill a supportive role will find the Mystic to be to their liking. The Mystic is a shaman of spiritual preservation and enlightenment, offering magical healing and relief from disease and poison. 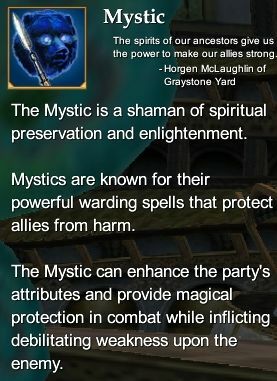 The Mystic can also use her powers to grant brief enhancements to her allies' attributes and provide magical protection in combat, as well as weaken and harm enemies. Mystic Epic Weapon Timeline (80) - Rise of Kunark Mystic Epic Weapon. This page last modified 2011-08-25 22:53:44.